UPDATE: We already have version 1.6.2, that fixes an annoying item bug. Notch tweeted about it just minutes after the launch. The time has come, Mojang has officially released Minecraft Beta version 1.6. This version brings over 100 bug fixes, and several new features. While we noticed alot of generalized clean ups, there were also some removal of bugs that were commonly exploited in the game. Players can now create craftable maps that will update as the player walks around. These maps persist server-side and can even be given to another player, providing a unique way of showing around visitors to your server. We've been waiting since 1.2 to see proper Nether support in SMP, and today is finally the day. You can now create portals in SMP and they will properly teleport you to the nether, just like in single player. Hatches act just like doors, except they can be placed on the sky-facing side of blocks. They allow you to create a pathway down to secret caverns or other underground structures. This was one of the more subtle, yet visually plesaing additions to the game. It just made certain areas of the world seem more realistic seeing tall grass off in the distance. Destroying the grass will sometimes yield you some seeds, however those seemed to appear less frequently then we'd like. This is probably going to upset alot of crafters, as this was the primary method of "boosting" minecarts. This method has been replaced, however, with the powered rails that were added in 1.5. As the video above shows, beds are only fixed in the most destructive way. Although, this does solve the crashing that was happening before. As Minecraft's scheduled release date looms near (11/11/11), it's good to see some of these long out standing bugs being fixed. The Mojang staff are going to be at E3 in a little over a week demoing Minecraft: Pocket Edition, and we'll be there keeping you up to date on all the new things we find out about there. Awesome. I'll go download it now! Craftciety, win real money through Minecraft innovation and creativity. Like a door, only sideways, i´ll make a screenshot wait a sec. is there a server software update as well? or will he release that later? a skilled user in the Hiten Mitsurugi Style. Multiplayer is not working for me. Everytime I download the newest version from the website, it says OUTDATED SERVER. Does this happen to everyone, or is it just me? Is lighting not working for anyone else? Areas are very, very dark. And torches do nothing to help light the place up. Well thanks for the insult. What I ment is that I downloaded the newest Minecraft_Server from minecraft.net. Its my own server. My game updated just fine, but it looks like he didn't update the Minecraft_Server yet. Hey mate i got the same problem its really annoying .... I am searching for a solution if i find anything i will let u know . So does anyone know the crafting recipe for maps? I've searched but must have missed it somewhere??? Never recreate real-world places in the Minecaft World. you will forget what is real and what is Minecraft. What? Why would you do this? You just effectively crippled my server's entire automated rail system, as well as those of many other players. All that hard work down the toilet. Did this feature NEED to be removed? Was it really hurting anybody? Or is this a cruel April Fool's joke that's two months late? And what's up with not being able to build new blocks on the top level anymore? 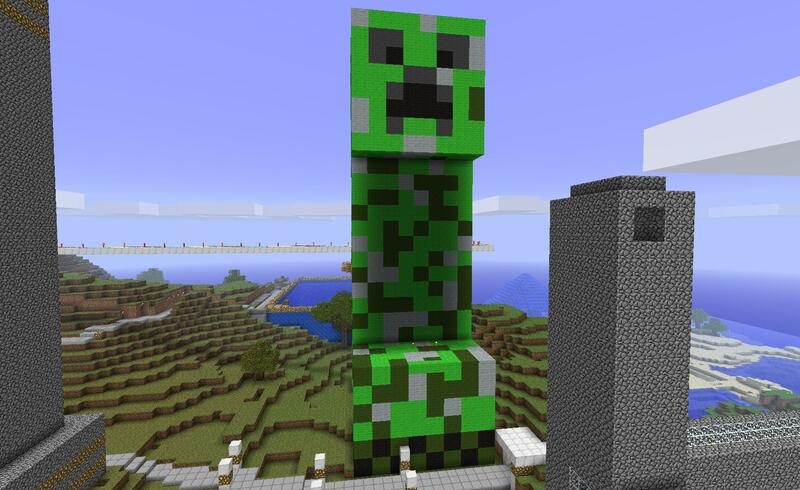 Now if some griefer comes along and chips a few blocks off the top of my giant creeper, I'm no longer able to replace them. Couldn't you just raise the maximum height on the map by one and make THAT level unbuildable? Or should I just rebuild the ENTIRE THING one block lower? I want Minecraft 1.5 back. The measly maps and trapdoors aren't worth the price of having months of hard work undone. Edit: I've also noticed that redstone torches can no longer be placed on glowstone. Did I miss that listing in the changelog? Some of us actually LIKE All the Bug Fixes, Maps, and Hatches. Too late. Besides, what am I supposed to tell everyone on my server... that they have to run old copies of Minecraft? Parallel-boosting carts wasn't a bug in my eyes, it was a FEATURE. Along with booster rails, it allowed us to build a fully-automated and efficient rapid-transit system that wouldn't screw up even in the famously buggy environment of multiplayer. Also, classy avatar. Gotta love Jack O'Neill. What? Why would you do this? You just effectively crippled my server's entire automated rail system, as well as those of many other players. All that hard work down the toilet. True this nukes every rail system that uses the booster glitch but then again it's not like the word hasn't been out for at least a couple of months that they were going to go away soon. I'm pretty sure that's why the booster rails were introduced, because Notch made it clear that the glitch was going to get fixed.Given that warning it only makes sense to have been preparing for when the glitch didn't work anymore. Notch's Tumblr, which is pretty much the only Minecraft news source I read, said "Fixed minecarts next to each other causing extreme velocities (sorry!)". Maybe it's the way that sentence is worded, but it didn't seem to me that they were going to remove parallel boosting ENTIRELY... just nerf it a bit. Y'know, no more EXTREME velocities instead of no more velocity period.